LOCATION.--Lat 41`28'25", long 77`13'52", Lycoming County, Hydrologic Unit 02050205, on right bank just downstream from bridge on State Highway 284, 0.7 mi upstream from Blacks Creek, 1.7 mi upstream from confluence with Texas Creek, and 5.0 mi northeast of English Center. PERIOD OF RECORD.--October 1940 to current year. GAGE.--Water-stage recorder and crest-stage gage. Datum of gage is 1,041.85 ft above National Geodetic Vertical Datum of 1929. Satellite telemetry at station. 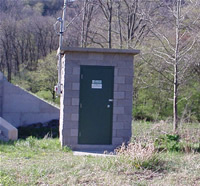 This station managed by the PAWSC Williamsport Field Office.